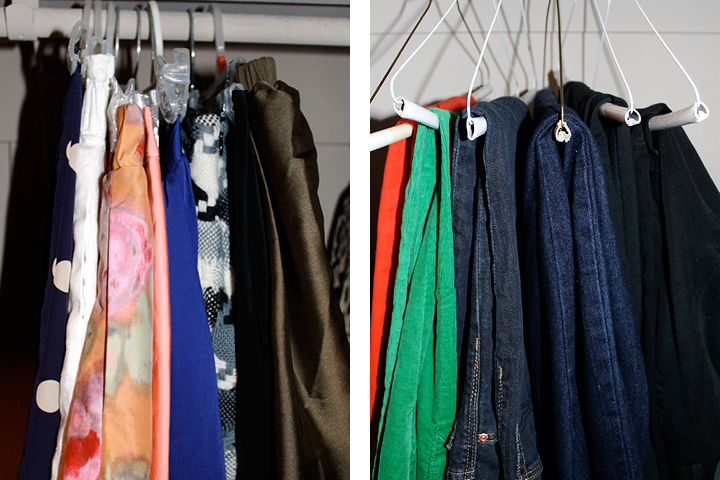 Keeping a well organized closet can lead to easier mornings and greater outfit inspiration. I tend to stick to organizing by color, rather than seasons. I believe that most clothing can be worn year round, it all depends on how you style it. So, if you are like me and have all your clothes out year round, keeping them organized is key to keeping your sanity. Follow my simple tips below to make your closet a little more organized, and your life a little neater. I have more purses than needed, so keeping them organized is key. I have a galley closet with high shelves. Keeping purses on the lowest shelf makes for easy access. Instead of keeping them organized by color, I have the organized by size. So, grabbing a clutch for a night out or large bag for a weekend away is simple. Keeping skirts and pants side-by-side allows for great outfit mixing potential. It is best to keep skirts on clip hangers so they stay wrinkle free, while pants do best folded on hangers. I'm not a huge skirt wearer, so they usually ended up arranged by the most used. But, pants are another story. I prefer to start with black pants, move into jeans, and then end with my colorful or printed pants. This way I can find exactly what I am looking for. It may not look like I have my tops organized, but there is a system. Like I stated earlier, I do not believe in changing your closet seasonally. Most clothing can be worn year round, it is all about how you style and layer it. So, I have all my tops (not just what is supposed to be in season) organized by color and patter, beginning with the lights and moving to the darkest. I organize my dresses just like my tops. Although, instead of starting with the lightest color, I start with red and move by the color rainbow to black and dark patterns. This helps me find the exactly what I want. I keep my most worn heels in sight on the upper most shelf in my closet. This allows for easy access and outfit mixing.